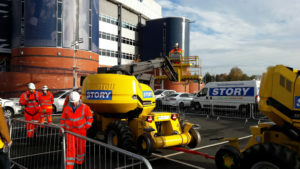 Our Plant division were invited to participate in a Safety Stand Down day with EGIP alliance – which took place Friday 28 October outside of Glasgow’s Hampden Park stadium. 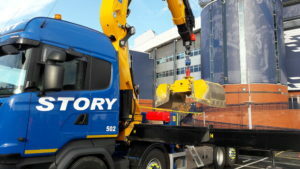 We demonstrated emergency recovery with 2 MEWP’s and fielded questions from the 300 strong audience, on topics such as the familiarisation, competence and technical procedures of the operation. As well as the MEWPs, our cutting edge Safety Hook attachment was demonstrated – showcasing its ability to significantly reduce the risk of working at height. The demonstrations were made up of 8 sessions throughout the day. Morgan Sindell, Costain and Babcock were also present at the event. It was the best safety day we’ve had, really well attended and focused throughout the day. The weather was good too which always helps! Events like these are a fantastic marketing tool for displaying our skills, generating new business and building on our reputation. A big thank you to all the team who supported.